The AccuGreen™ Broad Range dsDNA Quantitation Solution is designed for use with handheld fluorometers such as the Qubit® fluorometer from Thermo Fisher. The AccuGreen™ quantitation solution is specific for dsDNA, and can quantify DNA samples in the range of 0.2-100 ng/uL. The AccuGreen™ Broad Range dsDNA Quantitation Solution is designed for use with handheld fluorometers such as the Qubit® fluorometer from Thermo Fisher. The AccuGreen™ quantitation solution is specific for dsDNA, and can quantify DNA samples in the range of 0.2-100 ng/uL. This item is a standalone fluorescent DNA quantitation solution. The use of this product on the Qubit® fluorometer requires two standards. 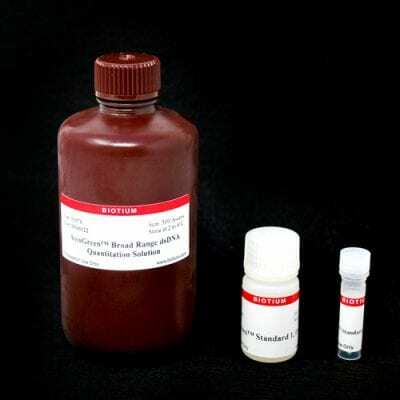 We also sell the complete AccuGreen™ Broad Range Quantitation Kit that includes the two standards (catalog no. 31069). For a high sensitivity assay to quantify DNA in the range of 0.01-10 ng/uL on the Qubit® fluorometer, see the AccuGreen™ High Sensitivity dsDNA Quantitation Kit (catalog no. 31066). For broad range DNA quantitation using a fluorescent plate reader, we recommend using our AccuBlue® Broad Range dsDNA Quantitation Kit (catalog no. 31007). See the table below for details on our full line of dsDNA quantitation kits. The AccuGreen™ High Sensitivity dsDNA Quantitation Solution is designed for use with handheld fluorometers such as the Qubit® fluorometer from Thermo Fisher. The AccuGreen™ assay is specific for dsDNA, and can quantify DNA samples in the range of .01-10 ng/uL.